My readers are so cool. Fefe, your point is well taken, and you may be right; however, in the spirit of Thanksgiving, I can’t help but mention that I’m grateful I’m literate, and that I hold the key to the delete button on my blog. My husband Matt is one of the greatest guys ever and I truly love him. (Go read our love story if you don’t believe it.) He even reads my blog and still loves me. I’d like to thank him for making our family Christmas card photo shoot so smooth and seamless the other day. I am a lucky woman. Rebecca Irvine (formerly known as “Scripture Mom”) is one sharp woman, and I’ve loved getting to know her a little through blogging. She wrote a family scripture study guide called Adventures with the Word of God, which I really liked– so many great cut-and-paste ideas for enhancing family scripture time. Now, her second book has been released and I think you should check it out, especially if you’re interested in having a collection of ready-made materials for Family Home Evening. “Family Home Evening Adventures can help your family learn to love and enjoy the scriptures together. Each monthly theme uses fun seasonal ideas to promote an appreciation of scripture study, teach basic gospel principles, and provide wholesome family activities.” It provides one complete lesson for each month and a guide of resources for the rest of the month. If your children are small like mine, and you need shorter lessons, I think her lessons could be broken up into segments and then used for several weeks throughout the month. Nice. Well, the lovely Rebecca is offering a giveaway of a copy of her book. Hooray! Just mention in the comments if you would like to be entered in the giveaway, and a winner will be selected at random on Sunday evening. Almost done here; I just wanted to point you to a couple links. Shelf Reliance makes food storage products. I’ve never bought any of their food items, but I do own one of their big can-rotation shelf systems, which I really like. They are a tiny bit pricey, but I noticed on their blog that starting next week, they’re having a huge giveaway every day and actually giving away some of the shelving systems and some other great stuff. This week, they’re offering half-off specials. If you’re interested, you can check it out here. 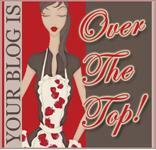 My laurel advisor, Marci, has been such a sweet supporter of my blog. Speaking of food storage, I remember her as the woman who had canned M&Ms because she didn’t want to go without real necessities in a crisis. Anyway, she emailed me this link that I thought was a great idea for Thanksgiving time. Xerox is offering free cards/postcards to be sent to troops overseas. All you have to do is go here: Let’s Say Thanks. You just select a card, write a note on it from your family, and then Xerox will print them out and send them to a random soldier at no cost. Easy, and for a wonderful cause. Finally, Kim, another beloved reader (who always makes great comments on the GCBC posts) invited me to participate in a meme/award. It’s 35 questions about me that I have to answer with only one word. I can’t imagine that anyone can handle reading anything more about me, but if you’re looking for an excuse to procrastinate your household chores just a little bit longer, you can read my answers here. Thanks, Kim! « My son thinks I’m a murderer of the Earth. Well, I think you are beautiful! (Love that picture of you and your husband. You look so lovingly exasperated!) I would love to be entered into the giveaway. I’ve been wondering how I can start making family home evening fun for my little guy. I really enjoy reading your blog, keep it up! AWESOME pic of you and your hubby. And yes you are pretty. I want to see that video clip of you and your hubby boring or likewise. Let me be the judge of that. I love that people are wiling to put videos of themselves on the web. It is pretty awesome! Keep up your goodness! I LOVE it. Yeah, you are beautiful, seriously, and isn’t it great to be beautiful AND smart?! Thanks for the tip on the FHE book–I’m always looking for something to spark the interest (and maintain the interest) of my little ones. FeFe’s spelling and grammer is almost as goos as mine! Who Knew???? That FHE book sounds awesome! Thanks Stephanie! I will be posting my link asap. I would also love the FHE book. My kids love FHE but I have a hard time finding constructive and spiritually educational lessons that aren’t too over my kids head. I, too, would LOVE the FHE book. I don’t think I’ve even commented on you blog for at least a year, but I’m here. (ANOTHER crazy stalker lady- just what you needed, right?) Thanks! And I would love the FHE book! I remember thinking how pretty you were in that video as well…your still pictures do not do you justice! I would love to be in the giveaway…boy do I need the help! I would love to be entered into the giveaway, and I have seen you personally, so I know Fefe is wrong. I also would LOVE to win the FHE book. Heaven knows I need all the help I can get! Ooh, enter me in the giveaway. I’d love to win it! I’m up for the drawing– I’m also up for new ideas on how to study scriptures with a 2 and 4 year old. We have that gospel art kit, and we pick out one picture, tell the story, and then we act it out. it takes about 5 minutes, and they love it AND remember it. Any other ideas or links to ideas for family scripture study with young’uns? I started a blog with a few ideas for scripture study with little ones. It has been neglected lately because of life… but I have posted how I get my ideas. You may like to have a look at it to get some ideas for yourself. Steph, keep up the good work. For all the Fefes in the world there is someone like you who isn’t bitter and hateful. My children are all in their late 20’s and 30’s and I still like to read your blog. I forgot to say I would love a FHE book. My grandchildren would benefit from it I’m sure. Stefanie. I thenk u ar pritty. Fefe don’t no what she is saying. p.s. I don’t think you’re blog is ugly, Fefe does. put me down for a book. I think LQ needs some outside influence if she is ever going to turn out right. So I just read your love story. I missed it before because that was the time period of my moving out here to Michigan. I loved it. My husband and I had such a similar experience in many ways. I love knowing that Heavenly Father truly meant for us to be together, even when people say it isn’t necessarily like that. For me it was. You are beautiful. What is up with FeFe? And, of course, I would love that book. Looks amazing. I’ve got little ones too and would love to have the book! Please pick me! Um…that comment had to have been a joke!!! RIGHT? I’m glad you hold the delete button either way though. You just totally crack me up and I love it. You are a beautiful daughter of God and we all love you. I have very much enjoyed “Adventures with the Word of God”. I wish we were more consistent, but it is a fantastic system for our family. Just enough study without losing the little ones. I’d love to have the set, so go ahead and put my name in the drawing. Love the photo… I remember your love story and loved it. You should call me… my little Henry would tell you that you are “so pitty! !” And the only reason he isn’t literate is because he’s two. So I think he has a pretty valid excuse. Can we google Fefe and inundate her with love mail? I think she needs a nap, but we can at least try killing her with kindness and see if that shakes her up a little. Sign me up for the FHE book, too– these also make great Sunday sharing time ideas for Primary! I think you are beautiful as well. I love reading your blog even though all my children are grown ups. Keep making me laugh!!! I’d love the FHE book. We’re a little at loose ends as to what do with a two-year-old and and ten-year-old so any ideas help. Family Christmas cards? What are those? People are so mean when they’re “anonymous” through the computer screen. You’re beautiful, inside and out!! And of course, I would love an entry in the giveaway! Who doesn’t love giveaways?? Why are people so mean? I think you are beautiful. I think your blog is great. Thanks for the heads up on Shelfreliance! That’s awesome. I’d love to be a part of the giveaway for the scripture book. How fun!